Keep your beer foamy right to the last drop with this innovative design. Any seasoned beer drinker knows to savor the first few sips of a proper pour—once the beer"s head is gone, the brew loses its distinct aroma. 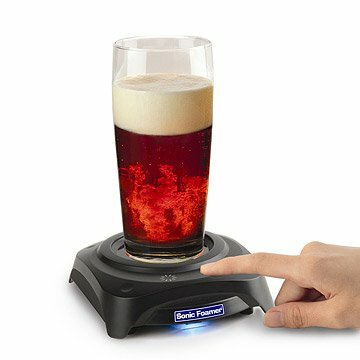 Using ultrasonic vibrations and two teaspoons of water, this innovative design revives the beer"s head throughout the drinking experience, so you can enjoy freshly poured taste until you"re ready for your next pint. Made in China. Always use on a flat surface. Do not use on carbonated drinks in sealed container, including unopened bottles or cans. Do not use rechargeable batteries or Ni-Cd batteries. Batteries not included. Husband loved this gift. Works as directions suggest and is easy to use! A great stocking stuffer - a little pricey for something that may not be used often. Downside was you had to add water to based and when you take the glass from the base the water drips on you or surfaces. I bought this gift for the hubby who is an avid beer drinker, and we were both very satisfied. It does exactly what it says it will and it's got cool changing lights underneath too. Our only hope was that it would be rechargeable, but sadly it is battery powered. Other than that, I would definitely recommend it to my peers.